Truck baby boy gift basket a Gigantic dump truck toy filled with baby boy knitted jacket sweater with matching knitted pants, baby book toy and much more.The new baby Truck will be a great toy for future or for older siblings, also for baby shower gift basket. One of our best sellers of baby boy gift hampers baby boy gift baskets filled with newborn products to welcome new baby boy to the world. 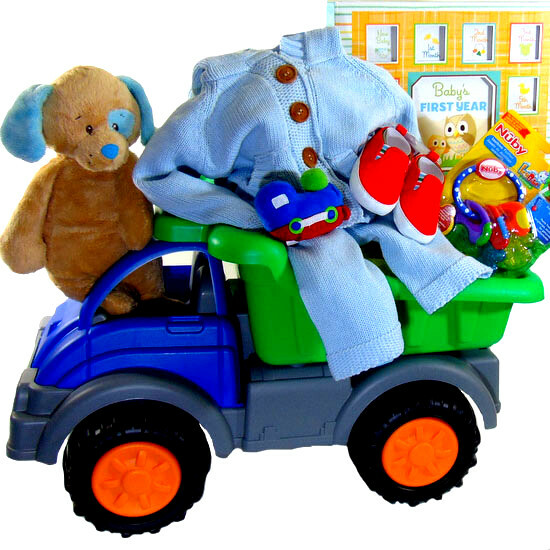 Baby Basket Truck a Gigantic dump truck toy filled with newborn boy knitted jacket sweater with matching knitted pants, book toy and much more.The Truck will be a great toy for future or for older siblings, also for shower gift basket. 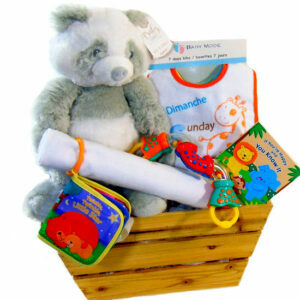 One of our best sellers of gift hampers baby boy gift baskets filled with newborn products to welcome new baby boy to the world. Baby Basket Truck Contains: Gigantic toy dump truck 24-inches. Blue cotton knitted baby sweater jacket. Blue cotton knitted baby pants. Baby Ganz puppy stuffed animal. Baby year book. Nuby key teether. Red baby shoes and Baby Ganz train rattle finger puppet toy.